Meet at the pagoda at the north end of Bell’s Bridge, Glasgow (Streetmap or aerial photo) unless otherwise stated, at 10am. Rides start at 10am all year round. Rides are generally around 30-40 miles in length, although winter rides are shorter. Often there is the option to return by train for a shorter ride. A lunch break is usually taken in a suitable pub or café en route, although you are welcome to bring your own picnic if you wish. Rides are usually on tarmac surfaces (road or path) and suitable for most types of bikes, e.g. tourer, racer, hybrid, mountain bike, but will occasionally feature sections of route on rougher paths or tracks – see ride descriptions for details. GoBike rides are social rides for GoBike members, and are not a club run. We would ask that anyone coming along adheres to the rules of the road, rides no more than two abreast, and takes the safety of other riders around them into account when cycling. If attending GoBike rides, please take a note of the GoBike phone number 07932 460093 to bring with you. Note: please only use this phone number for our rides; it is not a general contact number. Rides organised by GoBike except where stated. This ride will see us cycling through East Kilbride on our way to Strathclyde Country Park. 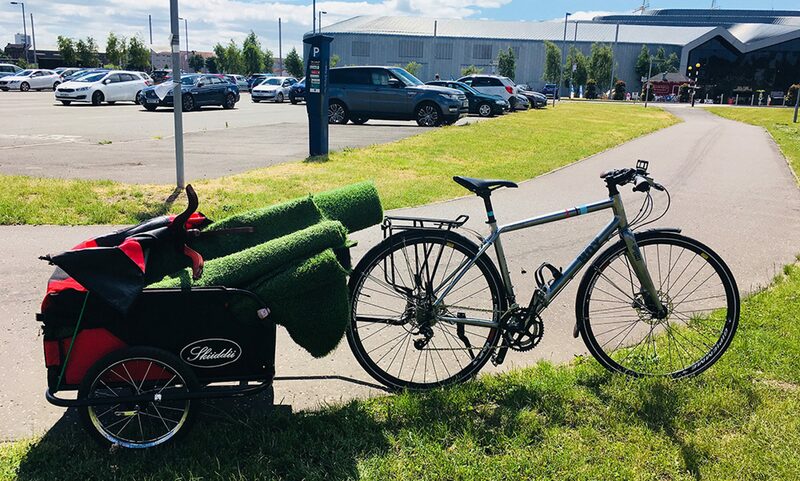 We’ll head out of Glasgow along the recently built cycle route connecting Queen’s Park and Muirend, then head up the hill to East Kilbride where we will cross the town on a mixture of paths and roads. Then out into the countryside briefly before descending through Hamilton to Strathclyde Country Park. After lunch, we will head across to Uddingston to return to Glasgow along NCN75 (including the Clyde Walkway). 35 miles round trip, including some short sections on potentially busier roads. Meet 10am Bell’s Bridge, Congress Road, Glasgow. The Falkirk Wheel is always a popular destination, so we’ll head that way again, stopping off at Palacerigg Country Park for lunch. Once we reach the Falkirk Wheel there will be an optional tour of the Falkirk area to see the Kelpies and other local points of interest. Some short sections will be on off-road paths. We will head south from Glasgow and Newton Mearns along the A77 cycle path. After lunch at the Dean Castle Country Park we’ll take the NCN73 path to Irvine, ending at the beach! 40 miles, returning to Glasgow by train. As usual, we will start on the bank of the River Clyde, and we will follow it downstream, crossing the Erskine Bridge and joining the Clyde Coastal Path. After lunch in Greenock there will be a local tour around the Greenock area to take in the views. 35 miles, returning by train from Gourock. Another popular destination is Strathaven, so we will take a circular route out through Eaglesham and back via High Blantyre, with a lunch stop at Strathaven. 45 miles, including some short but steep climbs. We will head out of Glasgow along the Loch Lomond Railway Path, but only as far as Dumbarton. After the lunch stop there will be a tour around the Dumbarton area to see some of the local attractions, including passing Strathleven House, before returning to Glasgow. 35 miles, largely on the flat. We will head to Renfrew to where the Cart meets the River Clyde before loosely following the White Cart upstream to Linn Park. Attractions en route include Paisley Abbey, Pollok Park and the Snuff Mill Bridge. 25 miles, ending back at Victoria Road. The themed ride this December will take an anti-clockwise tour around the northern side of Glasgow to see some of the many fine buildings and parks around the city, as well as visiting some viewpoints. We will pass railway stations, universities, hospitals and glasshouses, some older, some newer, and end up at Kelvingrove in time for lunch. 20 miles, including some short climbs. = GoBike star rating: 1 being easiest, 5 most challenging, based on distance, gradients, etc. Where do you want to cycle to? Let us know of your suggestions for future cycle rides. and for Ayrshire see CyclingUK Ayrshire. Mellow Velo organises rides across Central Scotland, and occasionally further afield. Bike Events Scotland lists cycling-related events from all over Scotland.